"This industry can be challenging because hardly any two days are alike. Flexibility is essential." Heath Spivey is a DELTA |v| expert experienced in international testimony. While his charming southern accent wasn’t the norm in the United Kingdom, the quality of his work and trial testimony were well understood. Professionally, Heath is the embodiment of perseverance. 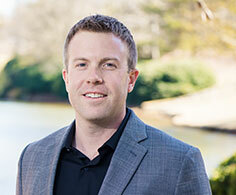 Heath joined DELTA |v| in 2007 as an Associate Engineer, with a B.S. in Mechanical Engineering from North Carolina State University. Since then, he has worked tirelessly managing complex client files during the day while earning a Master’s degree in Civil Engineering at night and on weekends. His Master’s thesis focuses on nighttime human factors and has been invaluable in helping clients resolve motor vehicle claims. Heath also has advanced professionally through formal training in vehicle simulation analysis and data harvesting of event data recorders in all kinds of vehicles. Heath’s pioneering spirit also helped launch DELTA |v|’s second regional office, bringing local boots-on-the-ground services to Nashville, Tennessee in 2014. A major milestone in the company’s history, the Nashville office has been well-received by clients needing a reliable resource in the area. Heath combines his technical prowess with an easygoing and approachable style that lends him great credibility when testifying in various legal settings. In his free time, Heath enjoys boating, kickball, mountain biking, and participating in mud runs. With his outgoing personality, it’s no surprise that he thrives at DELTA |v|.